Quindim, Quaker Oats, Qottab, Qurabiya, Queen of Puddings, Quesito, and Quirks. The feature was not available for use, but the XDA Developers did witness various signs in the leaked build's code confirming that Google is indeed working on bringing native support for secure facial recognition. The revamped settings, as per the leaked build, will be accessible through a dedicated 'Privacy' option and will let you tweak certain permissions like location access to only when you're using a particular app. Google has been allowing users to uninstall updates for system apps, but roll-back for third-party apps could mean a healthy new way to stay away from updates capable of breaking apps or destroying fancy features. It could be a major improvement for users. In the developer options of the leaked build, there were two new features - 'force desktop mode' and 'screen recorder'. The desktop mode didn't actually work, but going by that name, it is expected to deliver a desktop-like experience with full-sized apps (like Samsung DeX) on a secondary display. Meanwhile, the built-in screen recorder did work, but its interface appeared broken. Currently, all the content on the clipboard can be read by apps running in the background. This is a major privacy threat, which Google could be fixing with Android Q. Essentially, the company is working on permission which would specifically block clipboard reads by apps running in the background and improve the security of the user. 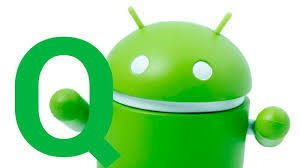 When Android Q will release? Going by Google's previous release timelines, we expect the first developer preview of Android Q to show up sometime in March. The next developer version and more details about the OS might be given at the Google I/O developer conference in May, while the final build could be pushed sometime around August or September.